The galaxy NGC 7673 is located in the constellation of Pegasus at an approximate distance of 150 million light-years. This picture is composed of three images obtained with Hubble's Wide Field Planetary camera 2 on 15 October 1996 and 11 October 1997. The three images were taken through a red filter (800 seconds), a green filter (1200 seconds) and an ultraviolet filter (2300 seconds) - shown in blue. Telltale patches of blue light are signs of the formation of millions of new stars in the tangled spiral galaxy NGC 7673. Each of the bluish areas in this image consists of immense star clusters containing thousands of young stars. These clusters lie on the spiral arms of NGC 7673 and so emphasise its somewhat ragged look. 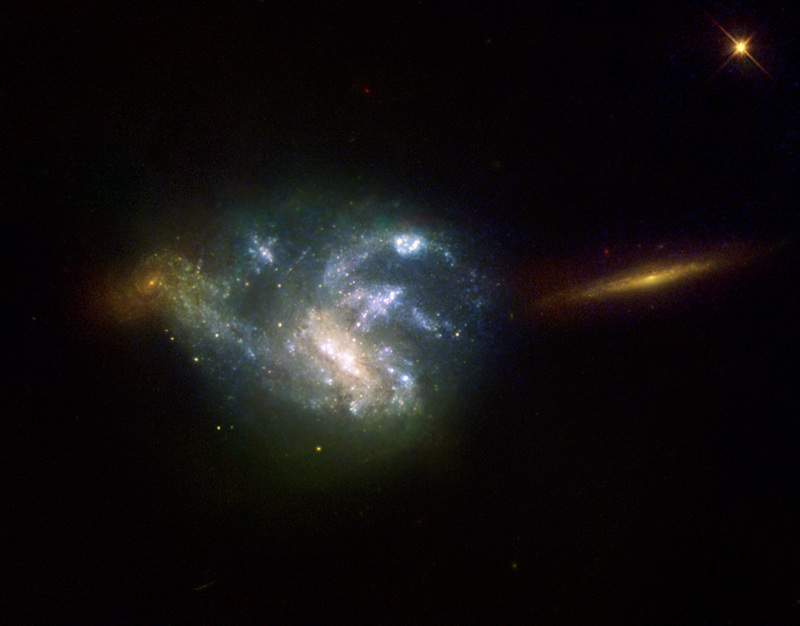 this image, taken form Earth orbit by the ESA/NASA Hubble Space Telescope in 1996 and 1997, also shows two other galaxies seen in the background of the image, to the left and right of NGC 7673. these galaxies are further away and so appear redder, due to their higher redshift, an effect caused by the expansion of the Universe. The youngest blue stars in NGC 7673 are blazing with intense ultraviolet radiation. Each star cluster radiates 100 times more ultraviolet light than the famous Tarantula Nebula (30 Doradus), the largest star-forming region known in the local group of galaxies.